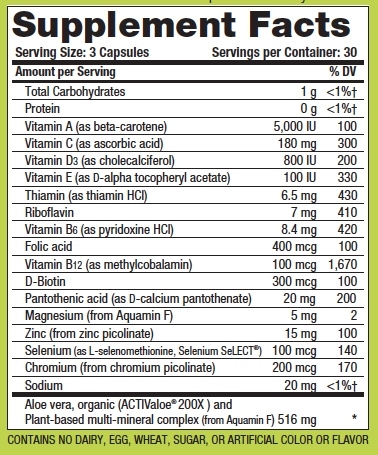 Whole Life Daily Multivitamins is rated 5.0 out of 5 by 1. Natural Vitality is proud to introduce a capsule companion to its best-selling premium liquid Organic Life Vitamins®. Whole Life Daily Multi caps are based on the same formulation as its liquid cousin including 24 organically-grown veggies, superfruits and fruits, organic quinoa plant protein and organic aloe vera. WLDM also contains a plant-based multi mineral complex, vitamins and other supportive nutrients all designed to provide a nutritional foundation for an active lifestyle. Capsule companion to our best-selling premium liquid Organic Life Vitamins, Whole Life Daily Multi caps are based on the same formulation as their liquid cousin. Organic ACTIValoe® aloe vera This functional food contains more than 200 amino acids, vitamins, antioxidants, minerals, enzymes and sterols. Aloe is an integral part of Traditional Chinese and Ayurvedic Medicine. Whole Life Daily Multi includes biologically active organic ACTIValoe. 24 organic superfruits, veggies and fruits Includes organic açaí, noni, goji, pomegranate, broccoli, pumpkin, collard greens, spinach, tomato, beet, broccoli sprouts, kale, carrot, banana, orange, pineapple, blackberry, tart cherry, raspberry, mango, cranberry, strawberry, apple and blueberry. Vitamins and minerals In addition to key vitamins (including methylated B12 for better absorption), each serving of Whole Life Daily Multi contains 500 mg of plant-based multi-mineral complex from Aquamin F. Multi-nutrient Whole Life Daily Multi incorporates organic quinoa plant protein, MSM (OptiMSM®), chromium and selenium (Selenium SeLECT®). Rated 5 out of 5 by ojaijoann from Multi Whole Life I have been taking Whole Life 2 months and it is easy to take without any reactions. It is one of the better natural vitamins I have found .